Disclaimer.The information provided here may damage your loudspeakers or reduce their value and is provided on the understanding that any of the following modifications are undertaken at your own risk. The LS3/5A is probably the most tweaked loudspeaker in the world! 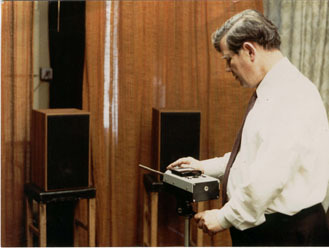 The original BBC Research team at Kingswood Warren spent many weeks refining the design and making tiny adjustments. At today's prices the development cost in excess of one million UK Pounds. But of course enthusiasts always want to tweak! The cabinet seal and Box Test. It is vital that the cabinet is completely sealed without any leaks and I want to thank Jim Finnie who used to work at BBC Kingswood Warren during the LS3/5A development for details of The Box Test. This is a quick and easy check on the goodness of your cabinet seals. Jim Finnie also told me how some of the LS3/5A enthusiasts at BBC Kingswood Warren considered it worthwhile optimising the crossovers. This was done by using a high- accuracy measuring bridge to check the value of crossover components, especially the capacitors. Closely matched components were selected and where required were finally brought up to correct value by adding small values of C in parallel. The aim was to bring the crossover component values as close as possible to their theoretical values in order to ensure that two LS3/5As in a pair were very closely matched. This kind of time consuming adjustment simply wasn't feasible for the manufacturers of production units which consequently exhibit a much wider spread. I understand that units tweaked like this are audibly better than "off the shelf" production speakers. I'm not suggesting replacing crossover capacitors and resistors with highly-expensive esoteric audiophile grade components. Rather this is an optimisation which is based on sound engineering principles. 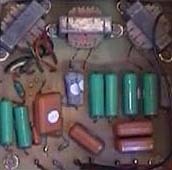 For an enthusiast with access to the right test gear, and a good selection of capacitors and resistors it need not be expensive. Removing the LS3/5A crossover from inside the cabinet where it is subject to vibration and large changes in air pressure would seem to be a worthwhile tweak. Cicable make an excellent highly optimised external crossover design which works very well. 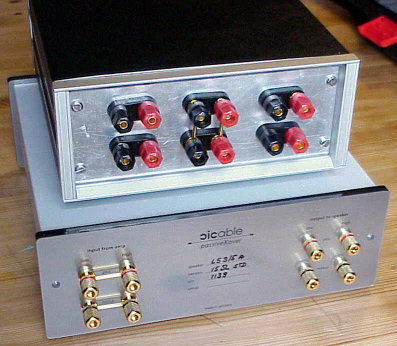 Jo Ki has done extensive work on integrating the AB1 sub-woofer with the LS3/5A. His way of interfacing them is known as Ki's Method.